Garmin zumo 500 Deluxe designed for bikers, features a superbright sunlight readable glove-friendly 3.5-inch display with preloaded maps for UK and Ireland a full 8-digit UK postcode search. The Garmin zumo 500 Deluxe also features twin Bluetooth connection for hands free calling, in-helmet voice guidance and to listen to music with the zumo's MP3 player. The Garmin zumo 500 Deluxe also comes complete with Eastern and Western European maps via Mapsource City Navigator NT DVD which can be transfered to the zumo 500 Deluxe. The Garmin zumo 500 Deluxe also provides access to speed camera locations. Garmin zumo 500 Deluxe has been discontinued. Accessories are still available for your Garmin zumo 500 click here. The Garmin zumo 500 Deluxe is preloaded with detailed UK and Ireland street data. You can customise the Garmin zumo 500's built-in fuel guage to warn you when it's time to fill up. The Garmin zumo 500 Deluxe also includes MP3 player and provides weather and traffic with the optional XM antenna. Plan your trip on your computer before you start. Search for food and fuel stops and local attractions. Then, transfer your route to the Garmin zumo and go. At the end of the day, share your favourite places and rides with other Garmin zumo riders, and review your travels in Google Earth. The Garmin zumo 500 Deluxe features left-handed buttons and a glove-friendly touch screen for easy operation. The Garmin zumo 500 Deluxe is also vibration-tested, waterproof and built with fuel-resistant plastics to withstand rides in all conditions. Cardo Scala Rider headsets are available to pair with your Garmin zumo 500 Deluxe. The benefits of buying and using a Scala Rider headset with your Garmin zumo 500 Deluxe are three-fold; 1. you can listen to sat nav voice turn-by-turn instructions, 2. listen to music and 3. communicate with other motorcyclists whilst riding (using the intercom when within range and mobile phone when out of range). Garmin zumo 500 Deluxe comes with motorcycle mount with RAM mounting hardware that fits almost any bike. The totally secure motorbike docking kit attaches the Garmin zumo 500 Deluxe with an audible 'click' so you know it's firmly in place. The optional Garmin Automotive Suction Mount allows you to use your Garmin zumo 500 Deluxe in your car. The Garmin zumo 500 Deluxe is preloaded with City Navigator® NT for United Kingdom and Ireland provided by NAVTEQ. NAVTEQ maps provide high quality detailed street level maps, which in addition to street information include features such as route calculation, Points of Interest (POI), Estimated Time of Arrival, and more. Further Garmin zumo 500 Deluxe maps are available SD card which insert directly into the Garmin zumo 500 Deluxe. Available Garmin zumo 500 Deluxe maps include North America. View the complete range of maps available for the Garmin zumo 500 Deluxe here. Want to fit and install your Garmin zumo 500 Deluxe motorbike sat nav on a second bike? You need to buy the RAM mount kitand motorcycle power cable. 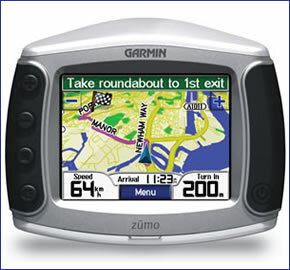 The Garmin zumo 500 Deluxe was preloaded from new with street-level road maps for UK and Ireland. If however, you want to take the zumo 500 further afield, we may have the map that you need. Garmin zumo maps available include: USA, Canada and Mexico, Australia and New Zealand, Morocco and Southern Africa. Question: I have a Garmin zumo 500 for my motorbike but want to use sat nav in my car. I need a mount and cable, I just wanted to be sure it will charge my sat nav ok in car. I've seen window bracket and cable on your website but I just wanted to know if it would work on my zumo 500? I have a window sucker mount but it has no socket it looks broken/missing it only has other smaller socket on opposite side of window bracket mount but I've tried charging from there but it isn't supported, message pops up on screen. I'll order what you think I need thanks. Answer: Accessories specifically for the Garmin zumo 500 can be viewed and purchased via the following webpage. Do you have a question about the Garmin zumo 500? Submit your question via our contact page.